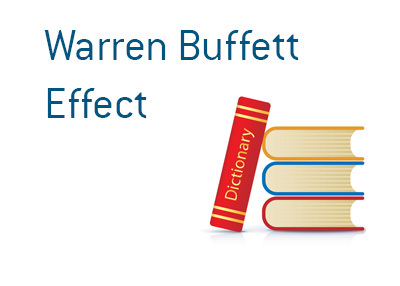 Warren Buffett Effect - What Does It Mean? What is the definition of the term "Warren Buffett Effect" as it applies to the stock market? What does the "Warren Buffett Effect" mean? The "Warren Buffett Effect" is the positive (or negative) impact that is felt in the markets when Warren Buffett, CEO of Berkshire Hathaway, announces that he is buying or selling a position. Warren Buffett is the greatest investor that has ever lived - there is not much debate over that, as shares of Berkshire Hathaway have soared ever since Buffett joined the company back in 1965. Shortly after Buffett took over, Berkshire Hathaway started diversifying away from the textiles business and the rest, as they say, is history. Due to his phenomenal success, many investors and funds want to copy whatever Buffett is doing. So, if Buffett announces that Berkshire Hathaway has purchased or sold something, many investors and funds will go out and do the exact same thing. This will obviously have a major impact on a stock, as there are literally thousands of people and funds who will buy or sell something based on Buffett's own movements. Thanks to the "Warren Buffett Effect", Berkshire Hathaway will often ask the SEC to refrain from revealing that name of a new stock that the company is in the midst of building a position in, so that other investors don't jump in and send the shares higher. This is a prime example of the "Warren Buffett Effect".